I've been in hibernation and am only beginning to yawn and stretch and come out of my cave. I'm moving slowly, feeling my way. I made the decision in late fall to stop what I had been doing for the past four years, which included birthing a goddess workbook and leading goddess e-courses. I sensed that a cycle was coming to a close. It was not just this creative cycle that I felt needed to come to completion, it was also a life cycle that I felt winding down. I have been moving through my second Saturn Return, which occurs every 29-30 years, when Saturn, whom we could think of as Father Time, himself, comes back around (in our natal chart) to see how we're doing. It is a time to review and take stock of who we are and where we've been and where we want to go next. And for me, the time had come to just Be, not Do. I want to write a book about the 13 goddesses I have been exploring and teaching, but first I needed to empty out. It was not so easy to quiet the nagging voices that wanted me to be productive and get this accomplished or that taken care of. But I stopped pushing and prodding, I stopped creating urgency and unease with To-Do lists. I let myself be the hollow bone for spirit to flow through. I began asking myself "What do I want to do?" rather than telling myself what I should do. And many times the answer was Do Nothing or Do What Spirit Calls You To Do Today, which might mean taking a walk, cooking a nourishing meal, reading by the fire, dancing, and sometimes it was creating a SoulCollage® card. I knew that this intuitive process I have been doing for a dozen years now would help me work with the energies surrounding me and discover what was rumbling beneath the surface. I began pulling a card from my deck every day, a practice I had stopped doing for awhile. 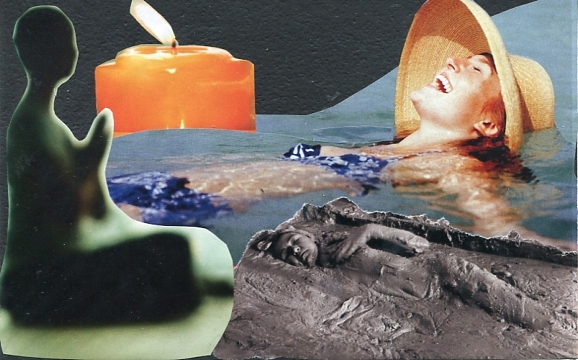 If you're not familiar with SoulCollage, in essence you are creating a deck of cards, much like your own personal tarot or oracle deck, by collaging found images that reflects You in your many parts, like a multi-faceted diamond. Two cards popped up for me more than once while I was in my dreamy, quiet, state of rest. They are cards from the Committee Suit, which represents our various personality parts, sometimes known as sub-personalities, as well as the many roles we play in life. My first instinct was to ignore them as they did not reflect where I was now and I didn't even want to go there, but I realized they were trying to get my attention and there was something I needed to see about where I had been. The first card, shown below, is The One Who Perseveres. This card represents the struggle, the will to go on even when it's hard, the obstacles to overcome, and the difficult balancing act of work and life. I made this card some years ago and now I saw it with new eyes. While it illustrates the feminine warrior in me persevering through various challenges in life, it also shows a woman in the foreground seated in a peaceful, meditative pose. Mother Mary is there, too, hidden in the dark stones, suggesting a blessing within such striving, a peace to come. That time has come for me. One of the things I have learned to do in creating a workbook and 3 years of courses on the divine feminine is to not make it harder than it needs to be. I think when we start out we often do things the hard way, striving more than we need to, often giving more than is called for. Over time, I eased up and found ways to work smarter, not harder. The second card is The Overwhelmed One. She is always running, trying to catch up, and feels there is too much to do and not enough time. She lives in her head and feels disconnected from her body. This time when the card showed up I realized how I have been doing so much on my own without help, feeling weighed down. I recognized how good it feels to release my burdens, to have beginner's mind again, and to ask for what I need and give it to myself. A new understanding came from looking at the card this time--that I wanted to collaborate more so that I am not trying to do it all by myself, which can feel isolating and exhausting. Last fall I felt inspired to initiate a regional SoulCollage facilitators group in the Carolinas, but this time I asked a friend and colleague, Glenda Cedarleaf, to co-create it with me. We had fun putting our heads together and bringing it to fruition. And out of that collaboration a weekend retreat we're calling A River Runs Through Us began to take form, which we will co-facilitate in the fall in New Bern, North Carolina, on the Neuse River. And this brings me to the theme of the river and a Big Dream I had recently. Big dreams are the memorable ones that get your attention, that have a sense of the numinous, in which a supernatural entity, event, or divine presence appears and often signifies a turning point in life. In my case, it was an evolutionary dream from the recurring ones I have had of being in a river, swimming with the current, aware that there are beings in the water with me, usually beneath the surface. I am frequently scanning the shore, getting my bearings, checking my progress, but swimming on. In my early dreams I was afraid of the creatures in the water with me, increasingly aware they were crocodiles, but over time and with active imagination work (encountering the beings and dialoging with them on a conscious level), I knew Mother Crocodile to be a protector, a guardian of my root chakra, who would buoy me if needed, and help me not only survive but thrive in the river of life. In the latest dream, I found myself on the river's edge this time, as if having finally made it to shore, and there was no sense of striving and surviving. There were three women: The Triple Goddess that was me--maiden, wading in the shallow waters, mother, floating out further in the river, and me, the crone now, standing on the river's edge--both observer and participant. Something sacred was happening on the right bank: a mother lion made of shimmering golden light was giving birth. We were all three watching in excitement and awe. And soon the luminous newborn lion swam out into the river, growing bigger as he came towards us. I let the mother goddess in the water know that it was coming up on her right. She looked over her shoulder at it, smiling, unafraid. Now it's on your left, I told her, as it passed by behind her, and she looked there to see it swim on into the river of life, gracing us with its illuminated presence. Then I, standing on the shore, was face to face with the lion-headed goddess, Sekhmet, who has a woman's body. She, too, was radiant and surrounded by light as she looked into my eyes. I knew it to be an initiation into a new chapter of my life as Sekhmet is the crone aspect of the Egyptian triple goddess. "You are where you need to be. You have reached the river bank and you can rest here. You can return to the river when you need to and be in the flow whenever you want. It is a choice now. This is your baptism into Cronedom."